A bright, poignant, and deeply funny autobiographical account of coming of age as an amputee cancer survivor, from Josh Sundquist: Paralympic ski racer, YouTube star, and motivational speaker. Josh Sundquist only ever had one girlfriend. For twenty-three hours. In eighth grade. Why was Josh still single? To find out, he tracked down the girls he had tried to date and asked them straight up: What went wrong? The results of Josh's semiscientific, wholly hilarious investigation are captured here. From a disastrous Putt-Putt date involving a backward prosthetic foot, to his introduction to CFD (Close Fast Dancing), to a misguided "grand gesture" at a Miss America pageant, this story is about looking for love--or at least a girlfriend--in all the wrong places. I’m not sure to what degree We Should Hang Out Sometime is non-fiction and how much of it is vaguely fictional. I mean, Sundquist probably can’t recall each conversation word for word, but I assume it’s pretty close to how things went down. This book covers real events, but also reads a lot like a novel. It also crosses from YA through to NA to adult as Josh relates his dating experiences throughout his life. The dating history is, admittedly, oft embarrassing. Sundquist admits to being awkward and he definitely over-thought everything. So basically he’s like almost all of us. Very few people have dating dialed in and totally know what they’re doing. His stories are very relatable, even if very few people probably ended up with their foot on backward at a golf course while on a first date. The awkwardness will speak to those who have been on dates before and will probably serve as a warning to be prepared for those who haven’t yet embarked on the joys of romance. 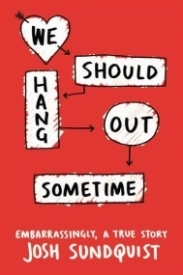 We Should Hang Out Sometime is Sundquist’s attempts to understand why it took him so long to get a girlfriend. He wanted to know what was wrong with him that kept him single. What it boils down it is a lesson we all can take to hear: deep down, he was afraid of being rejected. While his reasons might be different, the fear is definitely the same. I know there are probably people who liked me that I liked in return who I never knew about because I never took the chance. Sundquist is encouraging people to take chances, because, though it sometimes works out horribly, that’s the only way anything’s ever going to happen. Going to interview your past crushes to see what they were actually thinking is something I would love to do, since I pretty much always want to know everything. It definitely proved an interesting exercise for Josh Sundquist. He assumed in a lot of cases that the girls didn’t like him when in fact they totally did. He had no idea, often, how his own behavior might have come across as off-putting. I’m glad, though, that he included a scenario where the girl was decidedly not into him, because otherwise it would have felt very self-congratulatory. Still, I think it really speaks to how many missed connections there are just because people have so much trouble trying to understand one another. Peppered throughout are cute and humorous little diagrams. Sundquist says many times that he understands math much better than women, so they’re his attempt to math his experiences. While not necessary to the overall text, I thought they added to the overall mood and I’m glad they were included. The writing itself wasn’t my favorite, with a lot of simple sentences and fragments. I also didn’t get particularly involved on an emotional level, due to the way the story was told. You know from the outset that nothing’s going to work out, so it’s just looking at where things went wrong. It’s an interesting intellectual exercise, but not one that had me on the edge of my seat. Sundquist’s We Should Hang Out Sometime is an excellent choice if you’re into his YouTube videos or want to remember that dating isn’t just hella awkward for you.